Last week someone had said that a friend and I had ruined 60 years of what he believed to be an American, going on to say there is no more American exceptionalism. Well I am here to say that what he said is FAR from the truth. Like my good friend (and host of Live and Direct with G-Ski Rocks every Monday and Wednesday night at 9 PM Eastern on BlogTalk Radio) G-Ski Rocks of 20-20 Radio says, this is the greatest country on the planet BECAUSE of the exceptionalism in each and every American here. In order for American exceptionalism to be no more, well that would mean that each and every person who believes in it is dead and buried. While the Obama Administration might want that to happen, there is no way IN HELL that I will let that happen on my watch. The position of the Americans is therefore quite exceptional, and it may be believed that no democratic people will ever be placed in a similar one. Their strictly Puritanical origin, their exclusively commercial habits, even the country they inhabit, which seems to divert their minds from the pursuit of science, literature, and the arts, the proximity of Europe, which allows them to neglect these pursuits without relapsing into barbarism, a thousand special causes, of which I have only been able to point out the most important, have singularly concurred to fix the mind of the American upon purely practical objects. His passions, his wants, his education, and everything about him seem to unite in drawing the native of the United States earthward; his religion alone bids him turn, from time to time, a transient and distracted glance to heaven. Let us cease, then, to view all democratic nations under the example of the American people. 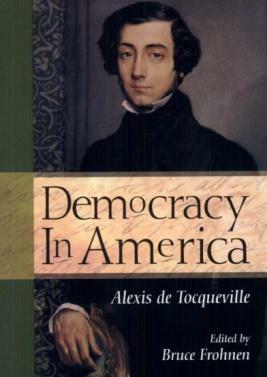 While de Tocqueville TALKED about American exceptionalism, the specific term was first used in 1929, when the Soviet leader Joseph Stalin, disagreeing with Jay Lovestone of the Communist Party of America that America was so resistant to revolution because of the increasing strength of American capitalism, and the country's "tremendous reserve power" (a strength and power which he said prevented Communist revolution), called Lovestone's ideas "the heresy of American exceptionalism." In the 1930s, academics in the U.S. redefined American exceptionalism as befitting a nation that was to lead the world, with the newer United States ready to serve the older European societies as an example of a liberated future free from Marxism and socialism. More recently, socialists and other writers have tried to discover or describe this exceptionalism of the U.S. within and outside its borders. 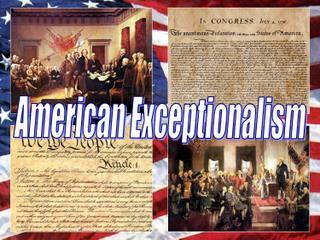 In future blog entries I will get into the details of American exceptionalism from my point of view, and give certain examples of it. But know that the only way American exceptionalism can die, in spite of everything Obama and his cronies do, is if the AMERICAN PEOPLE do not believe in it.